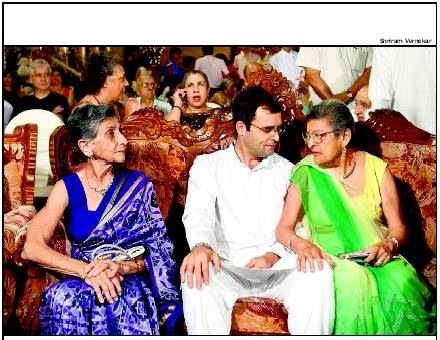 Congress leader Rahul Gandhi connected with his paternal roots and met up with his Parsi relatives at the wedding of his distant cousin Tanaz Patel at a gala traditional function at the Jeejeebhoy Dadabhoy Agiary at Colaba in south Mumbai on Tuesday evening. Rahul’s grandfather, Feroze Gandhi (husband of the late prime minister Indira Gandhi), was a Parsi whose surviving family members are based in the city. The Congress scion’s Parsi aunt, Ratu Dastur, is Firoze’s cousin. Rahul’s grandmother Indira Gandhi and his father Rajiv had also attended similar functions of their Parsi relatives in the city. Tuesday night’s function had a traditional, sitdown dinner on plantain leaves and consisted of jardalu chicken (chicken in apricots), sauce ni machi (fish in white sauce), bhona gosh, akuri and pulao dal. Original article in the TOI.